The BBC says it fired “Top Gear” host Jeremy Clarkson for physically attacking a producer and subjecting him to "prolonged verbal abuse of an extreme nature." 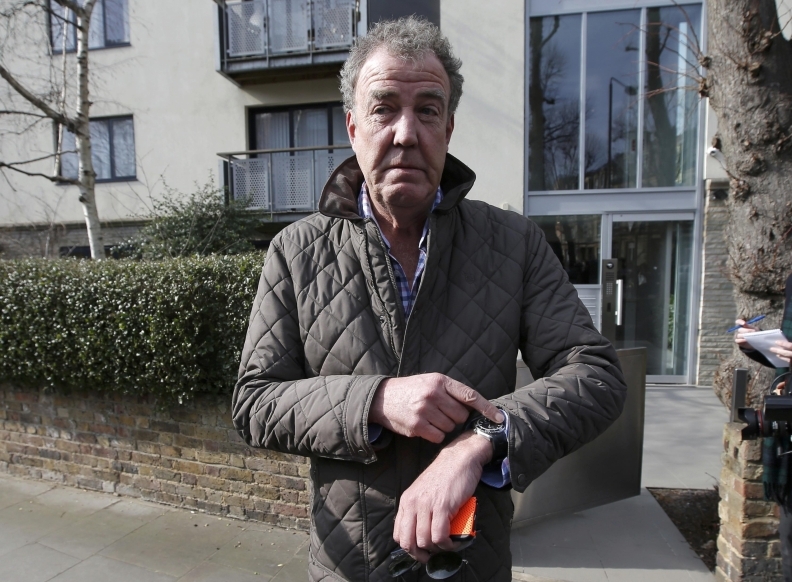 Prior to the incident, Clarkson had received a final disciplinary warning from the BBC over accusations last year that he had used racist language while filming the show. LONDON (Reuters) -- The BBC today dropped British "Top Gear" motoring show host Jeremy Clarkson, who built a global fan base while repeatedly causing offence with strongly worded views, after finding he had physically attacked a producer. The fate of Clarkson, 54, had been the subject of feverish speculation in Britain and beyond since he was suspended on March 10 following what the publicly funded broadcaster initially described as "a fracas". The BBC said Clarkson had struck producer Oisin Tymon, resulting in swelling and bleeding to his lip, and also subjected him to "prolonged verbal abuse of an extreme nature." Tymon later went to hospital. "It is with great regret that I have told Jeremy Clarkson today that the BBC will not be renewing his contract," Tony Hall, the BBC's director-general, said in a statement. "For me a line has been crossed. There cannot be one rule for one and one rule for another dictated either by rank, or public relations and commercial considerations," said Hall. Top Gear, which is aired in more than 200 countries, is one of the BBC's biggest money makers, with sales worth some 50 million pounds ($74.4 million) a year for its commercial arm. Those Clarkson has offended over the years include environmental groups, mental health and disability charities, cyclists, truck drivers, Indians, Germans, Mexicans and Argentinians. Many supporters see him as victim of a "politically correct" culture too eager to take offense. Clarkson could not immediately be reached for comment on his dismissal. "The BBC must now look to renew Top Gear for 2016. This will be a big challenge and there is no point in pretending otherwise," said Hall. Speculation has already appeared in British media that Clarkson could be snapped up by a rival broadcaster or by an Internet television service such as Netflix. Clarkson has 4.8 million followers on Twitter and after his suspension well over a million people in Britain and around the world signed an online petition asking for him to be reinstated. Clarkson's fans love his humor and relish in commenting on a range of subjects in deliberately provocative terms, but his many detractors see him as a boorish macho man posing as anti-establishment rebel despite his wealth and connections. Prime Minister David Cameron, who has socialized with Clarkson during weekends in the countryside and counts him as a friend, commented after the suspension that "it's a great program and he's a great talent". Before the attack on Tymon, Clarkson had already received a final disciplinary warning from the BBC over accusations last year that he had used racist language while filming the show. Last October the show sparked a diplomatic incident when a Top Gear crew had to flee Argentina after driving a Porsche with the registration number H982 FKL -- an apparent reference to the 1982 Falklands War between Britain and Argentina. Facing intense scrutiny over how it would handle the Tymon incident, the BBC sought to put the focus back on Clarkson's own actions by giving details of what had happened. It said the incident took place on a hotel patio in northern England where the “Top Gear” team had arrived to film on location. Tymon had been subjected to an unprovoked physical attack that lasted about 30 seconds, while verbal abuse went on for longer. "The verbal abuse ... contained the strongest expletives and threats to sack him [Tymon]. The abuse was at such volume as to be heard in the dining room, and the shouting was audible in a hotel bedroom," the statement said. It has been widely reported by the British media, though not confirmed by any of the parties, that Clarkson became angry because he wanted a hot dinner and none was available at the hotel late in the evening.